GEI Luncheon in honor of Hon. 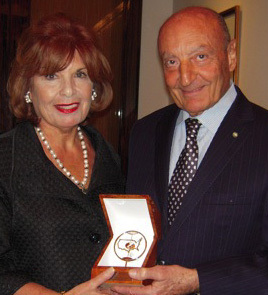 Patricia de Stacy Harrison, President & CEO of CPB – New York, April 18, 2010 – Remarks by Lucio Caputo – President of GEI. It is my great pleasure indeed to welcome back to GEI the Honorable Patricia de Stacy Harrison. I have been very fortunate to have known Pat for many, many years, she was our guest in 1998, and I have always admired her outstanding capacities and her many accomplishments. I am therefore very pleased that she was able to accept our invitation and be with us today. Ms. Harrison was named president and chief executive officer of the Corporation for Public Broadcasting on June 23, 2005. Before that, she had served as Assistant Secretary of State for Educational and Cultural Affairs since October 2, 2001 and as Acting Under Secretary for Public Diplomacy and Public Affairs. At the State Department, Ms. Harrison focused on reaching wider, more diverse publics, particularly young people, through international education and exchange programs. She created “Partnerships for Learning”, a global initiative providing young people with enhanced education and opportunity. Ms. Harrison also directed the historic resumption of the Fulbright Program in Afghanistan and Iraq. Ms. Harrison was awarded the Secretary’s Distinguished Service Award by Secretary of State Condoleezza Rice for excellence in leadership in these positions. As an entrepreneur and author, Ms. Harrison has provided more than 20 years of leadership in communication strategy, coalition, and constituency building. She is the author of A Seat At The Table: An Insider’s Guide for America’s New Women Leaders and the author of America’s New Women Entrepreneurs. As founder and president of the National Women’s Economic Alliance, she worked to identify women and minorities for leadership roles in business and politics. A founding partner of E. Bruce Harrison Company, which was among the country’s top 10 owner-managed public affairs firms prior to its sale in 1996, she created and directed programs in the public interest comprising diverse stakeholder groups, including the National Environmental Development Association, a partnership of labor, agriculture and industry working for a better environment. Appointed by President Bush (1990) to the President’s Export Council, Ms. Harrison served on the executive committee and worked to strengthen export promotion programs on behalf of U.S. business. She also chaired the International Committee, Small Business Advisory Council, Small Business Administration, and in 1992 was appointed to serve on the United States Trade Representative’s Service Policy Advisory Council. In 1997, Ms. Harrison was elected co-chairman of the Republican National Committee and served until January 2001. Ms. Harrison, a graduate of American University, received also an honorary doctorate from the American University of Rome as well as many awards and honors, including the 1999 Global Women’s Leadership Award. It is therefore with great personal pleasure that I present to Honorable Patricia de Stacy Harrison with the GEI Friendship Award in recognition of her many accomplishments. The luncheon was held on April 28, 2010 in the Stella Private Room of Le Cirque restaurant in New York City.